Is Cellulosic Ethanol Really the Fuel of the Future? The upcoming 2nd Americas Sugar Trade and Ethanol 2007 Conference organized by the Centre for Management Technology (CMT) promises a gathering of some of the brightest brains and most influential names in the Ethanol Industry in the Americas. The conference will be held at the Radisson Miami Hotel on 12 and 13 November, 2007. The wide-ranging discussions will bring you up to date on the economic, technological and geopolitical trends that are pushing ethanol as an alternative energy source into a bright future. The 2nd Americas Sugar Trade and Ethanol Conference will be held at the Radisson Hotel Miami on 12 and 13 November 2007. The Centre for Management Technology (CMT) has put together a comprehensive program of important keynote speakers. The speakers include CEOs and Executives of major corporations, senior members of government and important academics. Together they will bring you up to date on what is behind the glowing future of ethanol as an alternative energy source. Leading off for the conference is Frank Jenkins, President of the Jenkins Sugar Group Inc. who will discuss NAFTA 2008 and Impact of Market Integration On Sugar/Sweetener Trade. Adding to this Manuel Enriquez Poy, Director, Central Motzorongo Sugar/ Vice President Mexican Sugar Technologists Association will give an analysis of Ethanol In Mexico - A Way To Control Sugar Market. The effect the NAFTA will have on the international sugar trade is to be discussed further in a major Panel Discussion. Michael Liddiard of Kingsman Americas will look at global sugar demand/supply outlook and key production regions and consumption markets in his paper entitled Fuelling the Ethanol Boom - the Changing Dynamics of the Sugar Industry. "Sugar ethanol production is so advanced in Brazil that it had helped the country become independent of foreign oil by 2006," said Dr R Rajagopal, CCO (Chief Coordinating Officer) of Knowgenix, a research and growth strategy firm in Mumbai, India." The lead speaker on the second day of the conference is the Minister of Agriculture of El Salvador, Mario Salaverria, Ministerio de Agricultura y Ganaderia (MAG). He will be opening the discussion of the situation in Central America with a paper entitled El Salvador - Development of the Sugar and Ethanol Industry. Dr Bill Widmer, Research Chemist, USDA / ARS will start the analysis of the cellulosic ethanol industry with his discourse on Ethanol and Other Bio-Products from Citrus Processing Waste. "Florida's citrus industry could annually produce up to 60 million gallons (227.1 million litres) of fuel ethanol from its waste," said Dr R Rajagopal. Other papers will cover corn production and other alternative energy technologies. The Conference will conclude with a panel discussion on the Consolidation in the US Ethanol Industry - How will it happen or when? This will cover the long term demand for corn based ethanol in comparison to growth in next generation ethanol feedstocks. All in all, the conference will cover every aspect of ethanol as an alternative fuel. 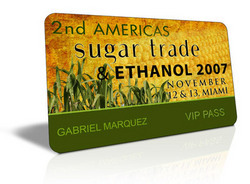 The 2nd Americas Sugar Trade & Ethanol 2007 Conference is specifically designed for those who need to keep abreast of the latest trends in the economics, technology and geopolitics of the Sugar and Ethanol Industries or are vitally interested in ethanol as an alternative energy source. To find out more and register please visit http://www.futureenergyevents.com. CMT is dedicated to the provision of the latest global technology and business information in the chemical industry through high profile conferences focusing on renewable, liquid energy sources. CMT has organized ground breaking conferences on Liquid Natural Gas, and LPG, future fuels like Biodiesel, Biofuels and Ethanol, and alternative energy like Coal to Liquids, Gas to Liquids, and Bio-mass to Liquid Technology. This has established CMT as the market leader in promoting this nascent industry as an alternative global powerhouse. CMT LogoCMT is dedicated to the provision of the latest global technology and business information in the chemical industry through high profile conferences focusing on renewable, liquid energy sources.